I still can’t believe I’ve been doing these setup posts for a YEAR! And here we are, setting up my bullet journal for August. It has become like second nature to reflect on the month, and figure out how I’m going to experiment for the next. Some things never change – like the fact that I use a travelers notebook style system – but I’m always evolving my system. It’s important to me to show you how the month actually went – so you can see the usefulness of the layouts I come up with. Everything tends to look real great at the initial setup, but if it doesn’t get used, it isn’t serving its purpose. Plus, I mess up, a lot, and my rapid log handwriting is something out of a 4th grade essay – and that is every bit a part of it all as my stamps and calligraphy. Here we go! Last month I ended up loving the monthly set up – I liked having my editorial and Instagram calendar right in my monthly, and felt anchored by the projects layout. As you saw, I tried the Rolling Week layout during a lighter week. I had a conference that week so I knew that I’d have some events to attend throughout the week, and also that daily tasks would vary widely. This is the wheelhouse of the original bullet journal system – the rolling week would allow me to have an overview of the week but the flexibility of space depending on the day. I skipped Tuesday, only used a few lines for other days, and used a ton on Friday. My verdict: it definitely has its use! I usually have about the same amount of tasks every day in a typical week, so a weekly has always been fine – in this case, with such a weird come-and-go week, I appreciated that I could use as much or as little space as I needed in a daily format (so that’s why people like it so much!). The week was really wide since I was trying to accommodate my weekly tracker stamp, so I would definitely try putting a row across the top for the rolling week. Lastly, I’d need to find a way to make sure I still maintained the gratitude and expense log – because without the structure, I lost them. I started using a run-sheet to hold the tasks I had delegated to other people or was waiting on. I really like it but don’t love that it’s a tip in. With these lessons, here’s what I’m doing for August! Note: this post contains affiliate links, which simply means if you happen to purchase anything I make a small commission at NO additional cost to you. Thanks for your support! To be honest, I’m not changing too much this month – which is kind of heartening. Even after doing this for a while, you should know that I make changes all the time. That is also why I NEVER pre-draw my spreads for weeks on end – because I guarantee will not be happy with it since my layouts change to support the kind of week I’ll have. My Foxy Notebook. Oh Kelly, what are you doing to me!! I started off with just one majestic Foxy Notebook cover (like a traveler’s notebook)… after many months I got another one…. then suddenly I have 2 more, whoops. Slowing the roll now, friends. This month I am moving into this beautiful pink lemonade ombre cover, with all the usual suspects for inserts. For the first time, I have a dashboard, so I made my own. I’ll put up a post soon on how I made it! I plan on using the front as a decorative anchor, and on the back side put a placeholder for things like post-its for various catchall notes. Interested in bullet journaling in a travelers notebook? Here’s what you should consider. Monthly Calendar. I loved last month’s grid so much I decided to give stamping another try. I’m using the Foxy Fix Foundations clear stamp set – a really easy way to get some robust shapes into your setup. This does take longer than sketching lines, so that’s up to you. I added the numbers in a beautiful Tombow N89 gray. As for its FUNCTION, I use this to keep track of my Instagram challenges and editorial calendar (my events live in my Google Calendar). This month I’m keeping it simple by identifying only the prompts I resonate with in each challenge. I’ll be popping into the #PlanWithMeChallenge, #RockYourHandwriting, the #PokemonthAugust by @BlackChalkCo, and perhaps #TeacherTime by @nerdy.teacher and @beilers13. Monthly Tasks & Project Management. I loved this layout last month so I’m updating it for August. Having those project boxes really helped me focus in on what I needed to do for these many many projects I have going on. Each box is a project, with the shaded three being the highest priority. Then I add in some critical milestones I want to hit to maintain momentum on that project this month. Often, I’d have projects that go untouched simply because I didn’t have it anchored anywhere. Even the process of creating this layout helps me remember what’s going on. Once again using those Foxy stamps and adding some color with some colored pencil. This month I added some categories – including the “Waiting” category to take care of the things I put on my run sheet. I’ve tried this before, so I’m curious to see how it works as a reprise (if you recall, I never used to use the monthly grid…. so there’s always hope in trying something again!). Weekly. Nothing much is changing here (you can find longer explanations of this layout here and here). What I do want to try is adding more structured project tasks in the bottom right – to identify specific projects and action steps connected to those projects. 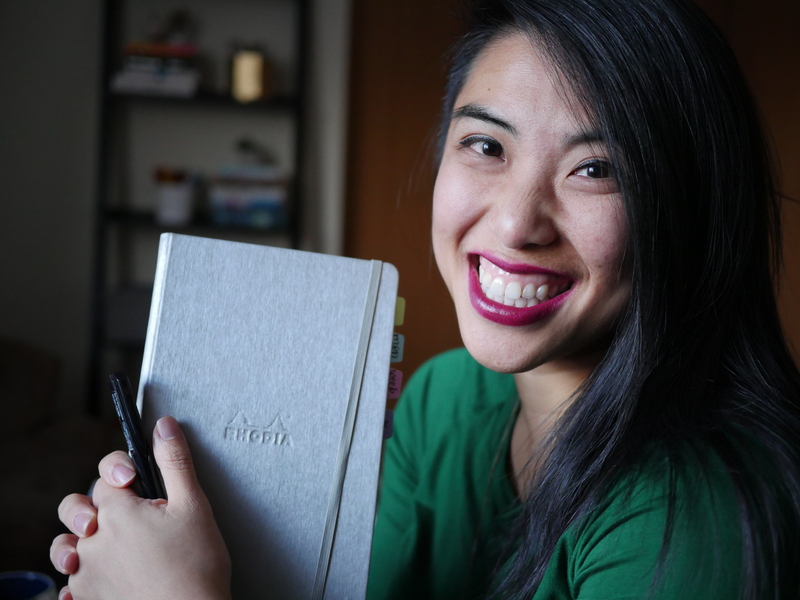 One of my next videos will be an update to my Bullet Journal for Work post – because I’ve been using the HELL out of that notebook these days! I can’t wait to show you. If you haven’t seen that I’m doing an EPIC blogiversary giveaway…. check it out! You have until Tuesday night to enter. I am finally jumping in and teaching a class in the cities! We are starting with handlettering in your everyday planners, notes, etc on September 10! I’m trying to convince her that we should also do a brush calligraphy class there, so if you want to learn, make it known! The Pretty Prints Shop is set to launch in just 2 ish weeks!! I can’t believe this is finally happening, but you’ll find prints, and art for now, and then TN INSERTS and notebooks coming soon, all with my art and lettering on it. I’m so excited to share it with you! WHEW – what are you trying in August? Are you going to join me at my workshop!? Let me know, in the comments! Happy Anniversary: It’s Giveaway Time! Wonderful. Did you add some detail to the squares? I did not see that on the stamps when I looked them up. Looking forward to your teaching setup! I start school next week and would love to see what you find useful for teaching. I wrote a few posts about this (16 layouts for educators and a project update) but I’ll be doing another set up soon! thats the best part! You figure out, in real time, through actually using it, what you need and want. Maybe even make a collection list of what changes you want to make?! We are working on shipping options but I wish it wasn’t so dang expensive! I love your blog 🙂 I am curious what ink you use. I have been irritated with my inks not drying fast enough or smearing and you never seem to have that problem! I primarily use a chalk ink and I’ve recently tried the versamark ink as well. Neither have given me any problem ! I also don’t tend to ink up a lot either maybe that helps! Where did you get the stamper for the weekly boxes with the lines on the side? I love the look of yours! Thanks! It’s from an etsy shop called atelier dreams! One thing I haven’t figured out, being new to BuJo, is how to handle the weeks that go across months. Do you put all of the days in one of the month, or have two different week pages or something I haven’t thought of?